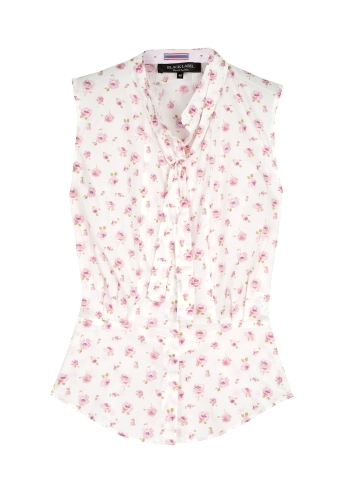 Produktbeskrivning för Sleeveless Rose Print Shirt by Paul Smith Black: Cream sleeveless lightweight cotton shirt with a pink rose print. Paul Smith Black shirt has a concealed button down front a button on removable bow neck tie ruched detailing to the front and back and a slim fit. Model is a standard size IT 40 and is wearing a size IT 40.